Reporter James Rose has a serious memory deficit. Check out this quote from Rosen's article on conservative Jim DeMint, where Rosen tries to demean the Tea Party movement. "DeMint was the only senator who addressed tens of thousands of Tea Party protesters Sept. 12 at an anti-Obama rally outside the U.S. Capitol. Some carried signs comparing Obama to Nazi founder Adolf Hitler and al-Qaida leader Osama bin Laden." 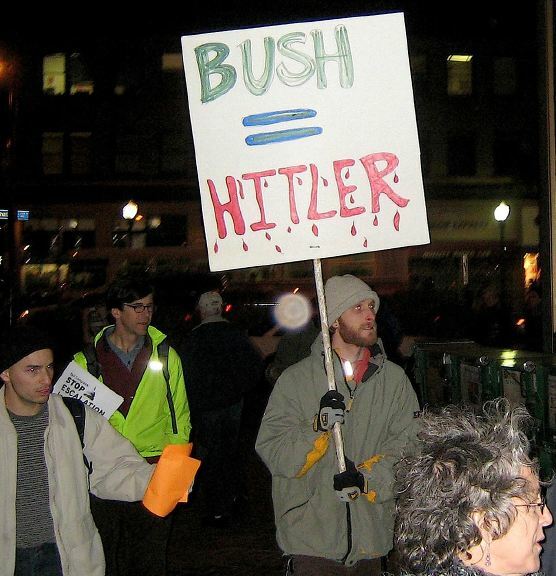 Uh, where was James Rosen from 2000 through 2008 when Lefties and Dems routinely compared Bush to Hitler? For more, just try this Google search. Thanks to the reader who pointed this out. I really don't have a problem comparing Obama to any totalitarian leader. One need only take a look at the fruitcakes he surrounds himself with to get a glimpse of how authoritarian minded he is. One, one can take a look at the use of political criteria in the decision as to which Chrysler dealerships to close. If the comparison of Osama bin Obama to Hitler is being made by the Larouchies, one need only point out that even a blind pig finds the ACORN now and again. Rosen also slandered Erikson with the link to Jeremiah Wright. His Erickson=Wright analogy of course fails the tests of logic or common sense. Wright was a racist, America hating revolutionary who used the name of God to move into his gated enclave.